Irvine junior guard Anete Klintsone steps onto the court on game day. Her left hand is heavily bandaged, and tape crisscrosses across each of her legs, connecting her ankles to her knees to reduce the pain of her shin splints. It’s a true testament of her style of play. Klintsone’s consistent energy, hustle, and tenacity on the court has earned her much praise from her coaches, including assistant coach Doug Oliver, who appropriately nicknamed her after a Looney Tunes character, the Tasmanian Devil. Her relentless attitude and never give up approach is something the Latvian-born guard developed at any early age. Coming from a family of basketball players, Klintsone recalls her first time picking up a basketball. It has been quite a journey for Klintsone since then. Having won consecutive bronze medals for the Latvian U-20 National Team and a gold medal at the U-18 level, as well as serving as the team captain of the U-16, U-18 and U-20 teams, Klintsone caught the attention of scouts at Jefferson College, a junior college in Missouri regarded as one of the premier NJCAA Division I colleges in the nation. That year, Klintsone’s contributions off the bench would help Jefferson advance to the NJCAA National Championship. Klintsone finished that year receiving first-team all-region honors, as well as being named the team’s Most Valuable Player. Perhaps the most important honor was the numerous Division I colleges calling for Klintsone’s services on the court. 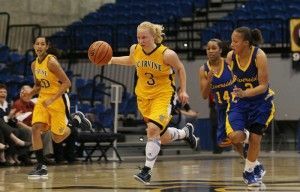 Klintsone and her family set their sights on UC Irvine, where more than 15 years ago, they witnessed Raimonds Miglinieks, another Latvian-born guard, lead the nation in assists on his way to becoming the Big West player of the year in 1996. The UC Irvine women’s team has certainly felt the impact of Klintsone’s contributions on the court. On Jan. 9th, she was the first women’s player to garner Big West Player of the Week honors this year after averaging 18.5 points, 6.5 rebounds, 3.5 assists and 1.5 steals per game en route to the Anteaters’ victories overUC Davis and University of the Pacific at home. Klintsone credits her humility and focus on a team-oriented philosophy toward the game to her European coaches. It’s not difficult to see how much Klintsone values team effort. She is always diving on the ground and willing to put her body on the line for loose balls for the sake of the team. On the court she is fearless. She tries to lead by example. “I do it for my team, my coaches and my family.